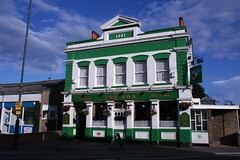 This is a popular and busy local pub. There is live music on weekend evenings and quiz and darts nights during the week. They have at least two hand pulled ales on most of the time, at least one of which is from the Dartford based Millis Brewery: most recently "Kentish Red" which is a fine ale from a local brewery. The pub has had a covered area in the beer garden that pre-dates the smoking ban and also has added new large benches with umbrellas at both the back and in the front - a nice touch at the front are the low canvas wind-breaks in the continental style. In what could be a first it now has a television outside in the covered part of the beer garden. Last visited by gellyfish, August 2007. Opening hours taken from the Fox website, February 2018. Last edited 2018-02-25 18:01:21 (version 13; diff). List all versions. Page last edited 2018-02-25 18:01:21 (version 13).